Huge selection: tens of thousands of products in electronics, office, photo, furniture, appliances, computers, and many more. 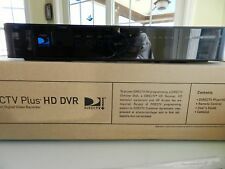 DIRECTV H25 HD Receiver. The H25 is a smaller HD Receiver designed to work onSWiM networks only. DIRECTV User Guide. SWiM only SAT-IN Tuner. This receiver is NEW. 3D Ready Receiver. Access Card. AC Adapter. TracVision RV1. Single 50' (15M) coaxial cable for power, data, and video enables easy installations and retrofits. Integrated Single Wire Multiswitch (SWM-8) built into TV-Hub supports up to 8 DIRECTV receivers. Part Number: H25. The H25 is a smaller HD Receiver designed to work onSWiM networks only. DIRECTV User Guide. SWiM only SAT-IN Tuner. 3D Ready Receiver. Computers. & Industrial. Any problem?. HR24 DirecTV Receiver. Manufacturer Part Number HR24. Product Model HR24. 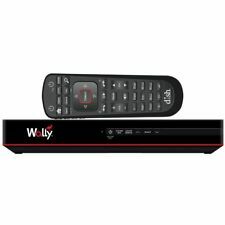 The DIRECT Plus HD DVR is the perfect way to enjoy all your favorite shows in HD, with the spectacular picture quality of DIRECTV HD programming. HDTV Tri-Sat Autoswitch 02-1637. 6' RF cable 32-0753-72. The H25 is a smaller HD Receiver designed to work on SWiM networks only. In The Box AC Adapter DIRECTV User Guide Access Card 6-Foot HDMI Cable RC65X IR Remote. You may also be interested in. TracVision TV1's sleek, IP-enabled TV-Hub is the belowdecks powerhouse that makes this advanced system simple to use. TracVision TV1. An easy-to-use installation wizard and single-cable design make this antenna perfect for fast installations or retrofits. KVH ROOF MOUNT KIT FOR A7/A9 DIRECT ROOF INSTALLATIONS. Rooftop Mounting. 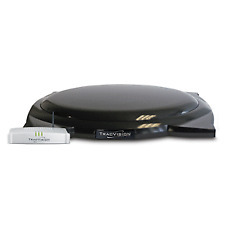 With its single-cable design, compact 37cm (14.5") antenna, and device-friendly user interface, the TracVision TV3 is a snap to install, set up, and use. The DVB-S2 compatible TracVision TV3 is the perfect solution for single- or multiple-receiver installations. The H25 is a smaller HD Receiver designed to work onSWiM networks only. 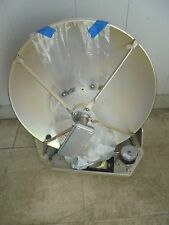 H25 DIRECTV Receiver. Marketing Information The H25 is a smaller HD Receiver designed to work on SWiM networks only. DIRECTV User Guide. For ease of use, KVH integrated simplicity into its sophisticated technology KVH's proprietary RingFire technology is a remarkable breakthrough in antenna design, fusing precisely shaped, tuned parabolic dish antennas with custom-designed, dual-mode feed tubes and uniquely modified LNBs. Destacker - Single Output. For use with KVH DIRECTV HDTV. Single Output. Manufacturer Part# 19-0347. Supports both HD & SD programming. DVR compatible through external USB hard drive (not included). "Totally fast totally great! Superstar service!". Why choose Bumboat?. Perfect for RVs, tailgating & camping. 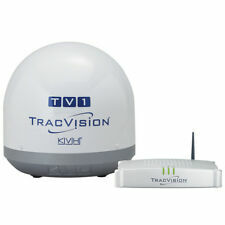 KVH TracVision A9 w/IP-Enabled TV-Hub - Direct Roof Mount Version. Traveling in your RV gives you the freedom to go wherever you want, whenever you want. TracVision A9 with IP-Enabled TV-Hub - Direct Roof Mount Version. TracVision RV1. World-class warranty coverage and support. DVB-S2 compatible. Single 50 (15M) coaxial cable for power, data, and video enables easy installations and retrofits. Product : KVH ROOF MOUNT KIT FOR A7/A9 DIRECT ROOF INSTALLATIONS. Manufacturer : KVH. Rooftop Mounting. Four rugged, watertight mounting pads secure the TracVision A7 or A9 to the roof for a streamlined installation. About Beach Audio. [Read our full policy ]. World-class warranty coverage and support. KVH IP AutoSwitch f/DISH Network. Manufacturer: KVH. KVH IP AutoSwitch. Health & Beauty. In case it will, we'll credit you less our S&H costs. We can send most of our products worldwide. Any problem?. Ground Block. Ground Wire (25ft). RF Cable (5 Ft). Rooftop Mounting. Four rugged, watertight mounting pads secure the TracVision A7 or A9 to the roof for a streamlined installation. A single cable connects the antenna to the receiver below. Manufacturer Part# 72-0151-01. Four rugged, watertight mounting pads secure the TracVision A7 or A9 to the roof for a streamlined installation. A single cable connects the antenna to the receiver below. We focus on making purchasing online a pleasant experience. KVH TracVision RV1. 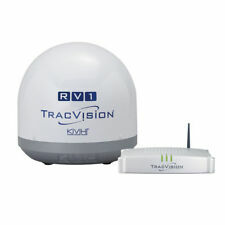 TracVision RV1. Manufacturer: KVH. Computers. & Industrial. Any problem?. Enjoy your item! Satisfied?. KVH 72-0151-01 Rooftop Mount for A7 & A9 Vehicles without Roof Racks. Rooftop Mounting. Four rugged, watertight mounting pads secure the TracVision A7 or A9 to the roof for a streamlined installation. TracVision RV1. DVB-S2 compatible. Single 50' (15M) coaxial cable for power, data, and video enables easy installations and retrofits. Integrated Single Wire Multiswitch (SWM-8) built into TV-Hub supports up to 8 DIRECTV receivers. For ease of use, KVH integrated simplicity into its sophisticated technology TracVision TV5. This rugged system is ideal for sportfishing boats or boats venturing offshore or to the islands. TracVision TV-Hub. Look no further than the WALLY from Dish Network. Perfect for RVs, tailgating & camping. 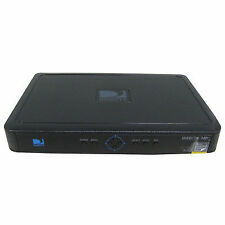 Small, fast and smart, this receiver is compatible with all Dish Network systems. It works quickly and quietly and is excellent for any installations where a small receiver is desired. TracVision RV1. DVBS2 compatible. Single 50 15M coaxial cable for power data and video enables easy installations and retrofits. Integrated Single Wire Multiswitch SWM8 built into TVHub supports up to 8 DIRECTV receivers. Manufacturer: KVH. Part Number: 01-0290-02SL. We can send most of our products worldwide. In case it will, we'll credit you less our S&H costs. Enjoy your item! Satisfied?. Any problem?. Height x Width. Manufacturer: KVH. Health & Beauty. In case it will, we'll credit you less our S&H costs. Enjoy your item! Satisfied?. We can send most of our products worldwide. Any problem?. Part Number: 19-0980. Rooftop Mounting. Four rugged, watertight mounting pads secure the TracVision A7 or A9 to the roof for a streamlined installation. A single cable connects the antenna to the receiver below. Downloadable Products. 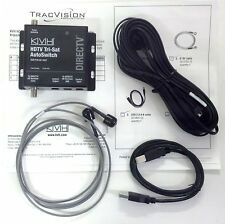 KVH TracVision A9 w/IP-Enabled TV-Hub - Roof Rack Mount Version. Traveling in your RV gives you the freedom to go wherever you want, whenever you want. TracVision A9 with IP-Enabled TV-Hub - Roof Rack Mount Version. Traveling in your RV gives you the freedom to go wherever you want, whenever you want. Product : KVH TRACVISION A9 W/DIRECT ROOF MOUNT. Manufacturer : KVH. TracVision TV1's sleek, IP-enabled TV-Hub is the belowdecks powerhouse that makes this advanced system simple to use. An easy-to-use installation wizard and single-cable design make this antenna perfect for fast installations or retrofits. Mount your H25 on the wall easily with this plastic bracket. We focus on making purchasing online a pleasant experience. Our sales office is located in beautiful town of Redondo Beach, California, just a few miles South of Los Angeles International Airport. Model: TracVision L3. We are unsure if this unit is fully functional. SEE PHOTOS. All images taken in house of the unit(s) being sold, except for multiple quantities where item received will be in similar or better condition.